I have been buying and selling cards for a while, but I have to admit that I’m not so sure about what rules apply and what rules don’t anymore. This year especially, I’ve been waaaaaaay off a couple of times recently and I want to try and fix that. I also want to see where some cards are coming in, to teach me some new ideas to guide me for this ‘three Masters sets in 18 months’ sort of world we are living in. I also want to try and apply what this year and previous years have taught me, to see if there’s stuff I want to start picking up, now that we are in the end-of-the-year doldrums. Philosophy #1: What will be good in a year? I didn’t like 18-month Standard, and I freely admit it. I dearly love scheduled-rotation Standard, as it gives me a very clear timeline to follow. I want to pick up cards at the end of their cycle, hoping that they will spike in about 2-3 sets, or 12 months. The timeline is fungible, the results are not. The best examples of these are Fumigate from Kaladesh and the bicycle lands from Amonkhet. 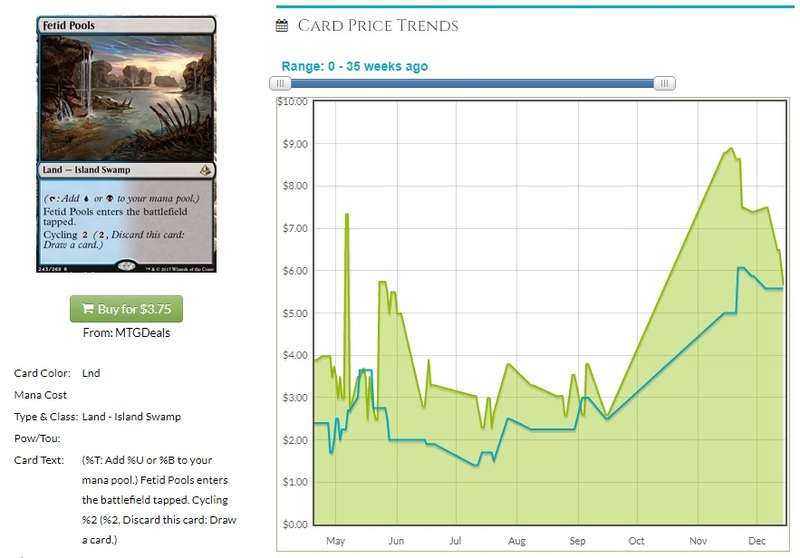 Fumigate was down to about $1.50 when Amonkhet came out, and stayed there until about a year after it was printed, when we got other good tools to play with it (notably Settle the Wreckage and Search for Azcanta) and it spiked to nearly $6. A land or a fresh card, every control player’s dream! Both Fumigate and Fetid Pools are rotating in ten months, making this a very difficult card to pick up in hopes of selling at a profit later. That ship has sailed, but there’s cards I’m thinking about. Vraska’s Contempt at $6 is a very intriguing card, but four mana is a scary cost for premium removal. While I want to dive in headfirst because Hero’s Downfall taught me to pick up the good black removal while it’s cheap, the need to exile creatures is also rotating in the fall, when both Hazoret the Fervent and The Scarab God go on their next great adventure. The other option for premium removal is Walk the Plank, and I’m scared here too. Being an uncommon isn’t terrible, just means you have to target buylists instead of eBay. Under most circumstances I’d happily get a hundred of these for a quarter each, as it’s seeing very little play and I’d be looking to buylist them for a buck each. Instead, vendors are wise to this play and are selling at fifty cents, a price that means my margins are pretty thin. 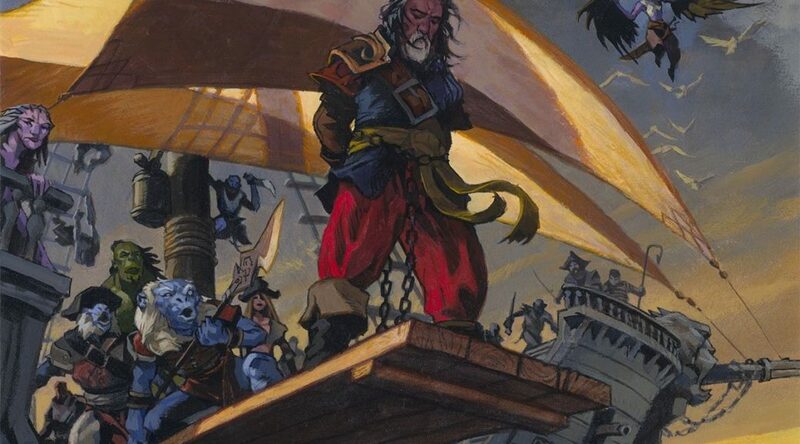 Plus, there’s a promo version out there, but I’d be betting that Walk the Plank jumps to a four-of in a lot of decks, gets to $1.50-$2 to buylist for my target of $1, and that’s a more dicey proposition for making fifty cents a copy. Personally, I am trying to decide between these two, and a couple of other targets are tempting too. Search for Azcanta at $9 is sweet, even with the promo version, but control decks aren’t playing four copies…yet. Deathgorge Scavenger is awesome at $3, as one of the very few ways to both affect the board and deal with graveyard synergies, but are there such strategies coming? I want to think that Wizards has learned the lesson about having answers, especially as we get to one-set blocks and we get wave after wave of new sets and new mechanics. We will see, though. Philosophy #2: Casual still rules, kind of? 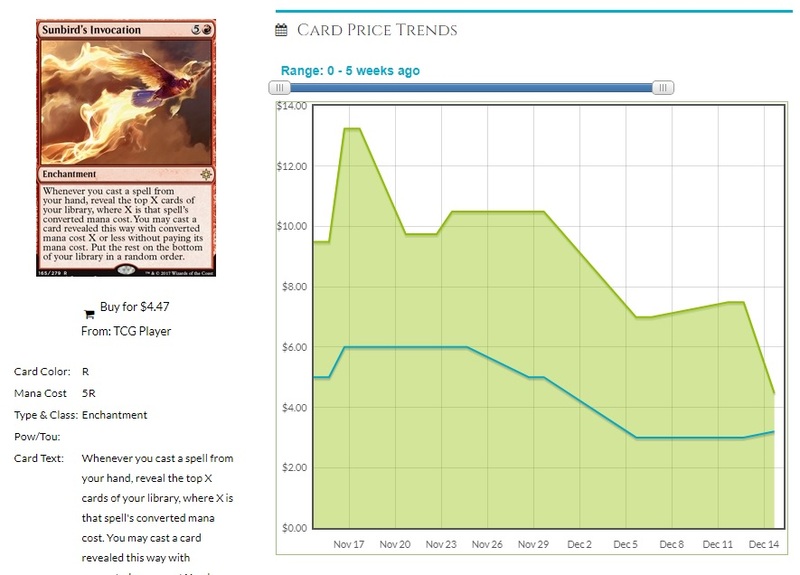 Commander is likely the reason MTG finance is still a thing. We’re all suckers for a format where you get to do most things, and assemble the jankiest of combos or play the tightest, most tutorrific deck guaranteed to take 20-minutes turns and win via disgust. Fun comes in many forms. The format is exactly what the market needed, from a gameplay perspective and a financial one, and we’re all benefitting. The downside is that we are getting hit over and over with reprints, and there are a lot of cards getting treated for repeated bashing right in the wallet. Most concerning to me is not when $10 cards get reprinted, but when $2 cards get that treatment and don’t have a chance to reach the lofty heights. And it’s a gorgeous foil, too! I know Sunbird’s Invocation in foil is EXACTLY an EDH card. It does nothing when you play it, it’s six mana, and if you untap with it in play you’ll be super far ahead. It’s at $5 and that’s after being more than twice as much at release. Those who had to have it immediately, they have it now and it’s time to start stocking up. At the same time, there’s stuff like Panharmonicon ($2.50/$8 foil) which should also be easy money, but I’m super wary of the reprint risk. I think I’m more likely to go in on foil Panharmonicon, but I’m not sanguine about it. This could easily be in Conspiracy 3 or some other non-Standard product. Cliff is an avid cuber and has been making mostly-sound MTG decisions since using Magic cards to buy a new transmission in 2001. Follow him on Twitter @wordofcommander or check out his articles weekly here on MTGPrice. So, cliff, is your price call to buy Sunbird’s foil at $5? My guess this falls to $3, I would buy maybe then. I think we all need to do a solid for the community and reevaluate what demand across this game looks like. Cause it looks real bad, especially compared to the supply curve. I see dangerous roads ahead through Dominaria and beyond. The foil multiplier is too high here, and this is exactly the sort of card EDH decks love. The demand for the foil is real, it’s above the 3x of most cards, so yeah, I would feel good at $5. The demand isn’t there for the nonfoil, clearly. We will see if this grows or stays at $5 indefinitely. I’ve made worse calls.